We quantify the contribution of alien species to the total breeding population numbers, biomass and energy use of an entire taxonomic assemblage at a large spatial scale, using data on British birds from 1997 and 2013. A total of 216 native and 16 alien bird species were recorded as breeding in Great Britain across the two census years. Only 2.8-3.7% of British breeding bird individuals were alien, but alien species co-opted 11.9-13.8% of the energy used by the assemblage, and contributed 19.1-21.1% of assemblage biomass. Neither the population sizes nor biomasses of native and alien species differed, on average, in either census, but alien species biomass is higher than native species biomass for a given population size. Species richness underestimates the potential effects of alien bird species in Britain, which have disproportionately high overall biomass and population energy use. The main driver of these effects is the ring-necked pheasant (Phasianus colchicus), which comprised 74–81% of alien biomass, yet the breeding population of this species is still only a small fraction of the estimated 35 million birds released in the UK in autumn. 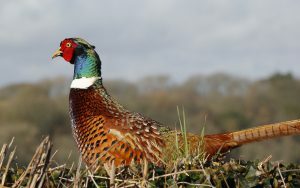 The biomass of this release exceeds that of the entire breeding avifauna, and suggests that the pheasant should have an important role in structuring the communities in which it is embedded.